From their centre just ten miles from Chester Le Street, Vitaphysical provides osteopathy and massage services to help you relax and treat your body’s aches and pains. Opened in 2007 by massage therapist Bronyia and osteopath Jason, the business was originally known as the Sunderland Back Pain Centre. Though Vitaphysical still treats hundreds of patients every year who have back pain or frozen shoulder problems, the name of the clinic changed in 2012 to better reflect the extensive range of conditions treated. 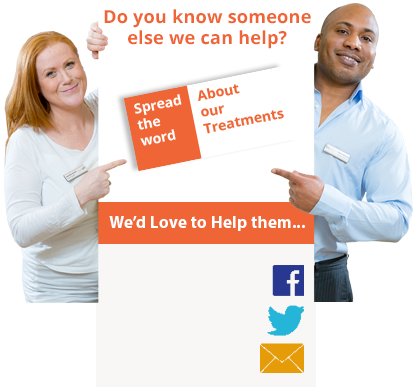 You can find a full list of the issues we work with on our what we treat page. If you can’t find your complaint listed, please get in touch to discuss your case with a member of our friendly team. We offer telephone consultations with our osteopath Jason to help match you with the best course of treatment for your individual goals. Relaxation, rejuvenation and recuperation are at the core of our impressive massage therapy offering. Our massage therapists Bronyia, Emma and Kirsty each have their own individual specialisms, allowing us to offer a wide range of massage therapies from traditional full body massage through to deep tissue massage, Thai massage and relaxation massage. To help athletes and amateurs alike we offer sports massage, which can be used to aid training or recovery from injury. Mums to be can benefit from our pregnancy massages – designed to destress and soothe the aches and pains of pregnancy. We are incredibly proud of the consistently high levels of customer service the team at Vitaphysical provides. We offer a 100% money back guarantee on all of our services and you can read a number of our patient success stories on this site. Patients come to us from Chester le Street and beyond, often having exhausted other treatment options. They may have undergone physio or attended chiropractor sessions with limited success. Being able to help these people is what makes our jobs so rewarding. If you’d like to book an appointment with us, you can do so using our online booking system. Alternatively, forward an enquiry by email to info@vitaphysical.co.uk or call 0191 565 8886 to discuss your requirements. The Vitaphysical clinic is located on John Street, Sunderland, close to Chester Le Street. We offer free on site parking and the centre is close to the city’s train station. We look forward to welcoming you to Vitaphysical for treatment soon. Don’t forget to download your free discount vouchers, redeemable against your fist visit.